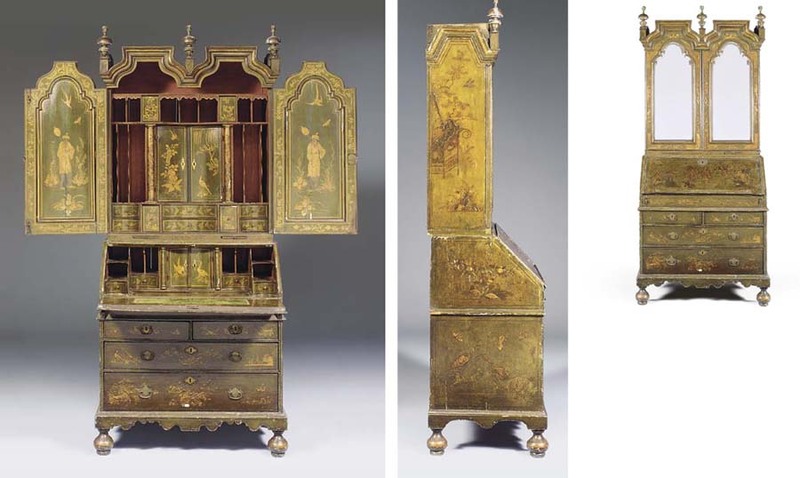 The bureau-cabinet, with its triumphal-arched mirrors and stepped pediment for china display, is designed in the French/antique fashion popularised around 1700 by the engraved works of the French architect, Daniel Marot (d. 1752). Its ornament of golden Chinese garden vignettes, on a richly varnished and green-japanned ground, had been popularised as fashionable for 'Chinese' or 'India' style bedroom-apartments following J. Stalker and G. Parker's publication of A Treatise on Japaning and Varnishing, Oxford, 1688. Such furniture was a speciality of the St. Paul's Church Yard cabinet-makers such as John Belchier (d. 1753), whose label has been recorded on a similarly decorated bureau dating from the 1730s (C. Gilbert, Pictorial Dictionary of Marked London Furniture 1700-1840, Leeds, 1996, fig. 69). The maker of the present cabinet is also likely to have executed a red-japanned bureau-cabinet acquired by William Hesketh Lever, 1st Viscount Leverhulme (d. 1925), as this shares the same pediment and similar Chinese-fretted stand and bulbous vase feet (A. C. Tait, 'Furniture at the Lady Lever Art Gallery', Apollo, October 1947, fig. 7). A second red-japanned bureau-cabinet, acquired by Lord Leverhulme in 1923, also shares the same pattern of pediment and fretted stand, but has brackets in place of vase feet (sold from Thornton Manor, Sotheby's house sale, 26 June 2001, lot 221).